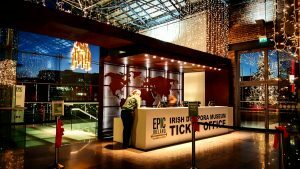 The Epic Ireland exhibition in Dublin’s docklands is very aptly named for it truly is EPIC. 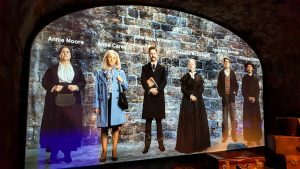 Charting the history of the 10 million people who have left Ireland for foreign shores, Epic Ireland brings their amazing stories to life in a thoroughly engaging and interactive way. Through 20 state-of-the-art galleries, visitors immerse themselves in the stories of some of the most remarkable tales of sacrifice, endurance, adventure, and discovery the world has ever known. 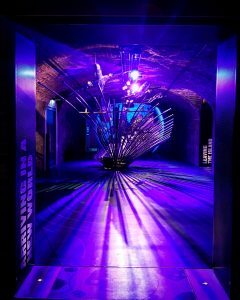 It gives visitors a fascinating and unique insight into how Irish men and women changed, and continue to change, the world. As a proud Cavan girl through and through, it left me with a huge sense of pride in their accomplishments and the impact that our little island continues to have globally. Everything about Epic Ireland is as high-tech as it gets and all the better for it. The €14 entrance fee for adults (€22 if you buy a combined ticket with the Irish Family History Centre) might seem a little high at first, but once you enter it is clear to see where the value is. 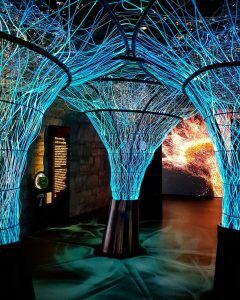 From the very start, I was immersed in a sensory smorgasbord of touch screen technology, light shows, video, music and beautifully designed galleries that flow from one to the next with ease. 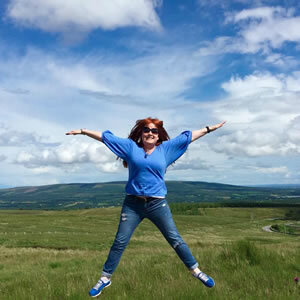 From ‘Leaving the Island’ you are swept through a myriad of colourful and informative spaces which detail Irish endeavours abroad in such diverse fields as Sport, Science, Military, Civil Rights & Design with a fun gallery on Music & Dance in between! It’s hard to beat an adrenalin shot of Thin Lizzy’s Whiskey in the Jar as you wander around the bright music displays. The stories jumped off these displays, literally in some cases. 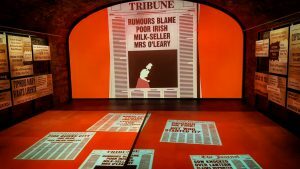 In the ‘Achieving Infamy’ gallery for instance, which lists several Notorious Irish sons & daughters, arrows pointing to culprits on the large video screen move with you! And you can even play a quiz based on the person you choose to learn about, though it is a very public way of highlighting your lack of knowledge if you get the questions wrong (I got nil points!). My favourite gallery was the Storytelling space and the library room. 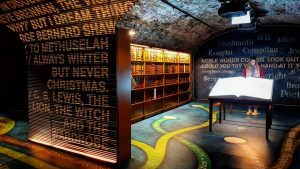 Dominated by a large interactive video book, the room is lined with books by Irish authors or those with Irish connections. It even includes some books you can pull out and listen to! The impact of Ireland and the Irish on great works of literature really is astounding and I had no idea there were so many works written by or connected with the Irish. Interesting facts abound at Epic Ireland. Did you know that James Joyce’s Ulysses has over 30,000 words? Or that the highest Irish pub in the world is The Dubliner in La Paz, Bolivia at 3.6km above sea level? Or that over 1 million Argentinians claim Irish heritage? And the best part? It is all condensed into small text titbits and there wasn’t the vast amount of reading you sometimes see at these kinds of attractions. However, there are audio guides available if you want to learn more without reading, or if you are short on time. And if all that weren’t enough, on finishing the exhibition, you can visit the Irish Family History Centre to learn more about your own family’s personal journey both here and abroad. A separate ticket here costs €9.50 or you can buy a combined exhibition ticket for €22. This includes a consultation with the genealogist and a free subscription to the Find My Past website (worth €14.95) and Ireland Family History Centre online (worth €10). The staff here are great at explaining where to go or how to get started with your research. I met the very friendly Dan first who was very helpful in explaining to me how the Centre worked and how I might go about researching my family tree. I then sat for a consultation with the genealogist Maura, a lovely lady who is obviously passionate about her job. Within minutes she had pulled up the 1923 marriage certificate of my grandparents in Limerick (I have never seen this!) and my Grandad’s medal record during WW1, capping off a wonderful visit. This centre adds value to the whole experience and is well worth the price. A word of advice though, visit now if you can as it can get very busy in the summer months, and have at least a name, location and date or year of birth if possible if you want to look someone up as time is limited. 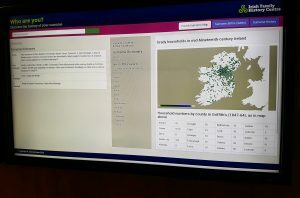 So, all wrapped up in its state-of-the-art technology and interactivity which is very impressive and great fun to partake in, Epic Ireland & the Irish Family History Centre is, at it’s heart, really all about people. From Annie Moore, the first immigrant to pass through Ellis Island in New York, to Samuel O’Reilly, inventor of the first electric tattoo machine and finally my Grandad who fought during WW1 and married the girl 5 doors down the street (news to me!). You should leave Epic Ireland feeling touched and proud of all that our countrymen and women have accomplished. The ripple effect of the Irish Diaspora continues to be felt around the world and will do so for ever more. And nowhere else can one see or learn more about these people and their stories than at Epic Ireland. Great for kids and adults alike, I thoroughly recommend a visit.